SEPTEMBER 18--The California man who helped orchestrate O.J. Simpson's memorabilia recovery mission (and then sold an audiotape of the raid to a tabloid web site) is an ex-con whose rap sheet includes at least four separate felony convictions, including arson, prison escape, and stolen property charges, The Smoking Gun has learned. Thomas Riccio, 44, has emerged as a key player in the Simpson case and, presumably, would be a witness at any future criminal trial. Riccio, a sports collectibles dealer, set up Simpson's visit to a Las Vegas hotel room where the former athlete and his associates allegedly seized memorabilia at gunpoint from two businessman. Riccio recorded part of the confrontation at the Palace Station hotel and then sold the tape to TMZ.com, never bothering to tell police about his surreptitious taping. Court records show that Riccio--who has spent a combined total of eight years in prison--was first convicted of a felony in 1984, when he was nailed in New Jersey on a federal charge of conspiracy to receive stolen goods. After bouncing around the prison system for several months, Riccio landed at the federal lockup in Danbury, Connecticut in October 1984. Less than three months later, Riccio escaped from Danbury, where he was apparently held in a minimum security facility. Riccio spent about five months on the lam before being apprehended in California. He was subsequently convicted on a separate escape charge, which resulted in additional time in the federal system. 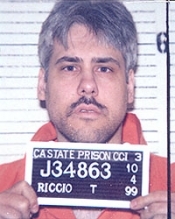 Riccio left a Texas prison in August 1988 for a halfway house, where he spent a month before his release. In total, Riccio spent nearly four-and-a-half years in federal custody on the stolen property and escape charges. Riccio was then arrested in early-1994 on arson and possession of flammable materials charges. He later pleaded to those felony counts in California's Orange County Superior Court and was sentenced to two years in state prison. That term, as it turned out, was served concurrently with yet another Riccio felony conviction, this one stemming from the theft of nearly $500,000 worth of rare gold and silver coins. In that Los Angeles Superior Court case, Riccio was nabbed for trying to fence coins that were boosted from a numismatic dealer show at a Long Beach Convention Center show. According to court records, Riccio was arrested when a vigilant Glendale dealer called cops after he recognized a rare 1870 Cuban copper coin as having been stolen from Miami dealer Arthur Smith. When cops later confronted him in the businessman's store, Riccio exclaimed, "You can't prove they are stolen." A subsequent search of two safes at Riccio's home turned up 1100 more coins swiped from Smith, along with other items belonging to the veteran numismatist. Riccio claimed that he had recently purchased the valuable coins for $4500 from a white male who came into his baseball card business. Riccio admitted to police that he sold some of Smith's coins in Dallas, Omaha, and Oklahoma City. Additionally, before the Glendale dealer became suspicious and called the cops, Riccio had, on two occasions, sold the businessman some of Smith's coins. At Riccio's request, the dealer paid him in Krugerands. A Long Beach jury convicted Riccio of receiving stolen property, a felony for which he was sentenced to three years in prison. He was also ordered to pay Smith $165,000 in restitution. As a result of the two separate state convictions, Riccio spent 37 months in the California state prison system. He was released in October 1997, but was incarcerated again in mid-1999 on a probation violation (the details of which were not available at press time). After four months in custody, Riccio was released.